Advanced styling and six tray version of smaller and more basic Mercato 3000 sold in warehouse clubs under the name Selectivend. Vends up to 36 selections. Standard configuration is 26 selections. The Mercato WS3000 will a wide variety of snacks, candy, gum and mint, as well as many types of packaged non-food products. 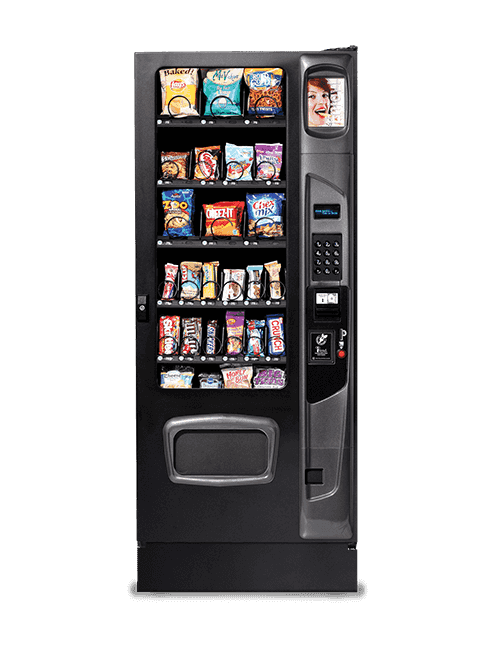 Optional six selection CB300 summit satellite beverage vending machine that operates off of the control panel, coin mechanism, and bill acceptor of Mercato WS3000. Also available in an all cigarette version. ADA ready. The Mercato WS3000 can be financed through the factory’s in-house finance company, USI/Inland Finance, with zero down payment and up to 36 monthly payments of $131.07. Net 30 terms as well as ninety day interest free financing is also available. The price of the vending machine includes coin mechanism and bill acceptor. The Mercato WS3000 snack, candy, dry goods vending machine is credit card compatible. There is a two year parts warranty. Optional six selection CB300 Summit can/bottle satellite soda/beverage vending machine available.